Guests and their dolls can enjoy a fairy scavenger hunt and party favors, purchase doll clothing, have their photos taken with their favorite doll(s) and much more. Last year’s inaugural Girls & Their Dolls Garden Party was so successful and earned such rave reviews that the Hull Family Home & Farmstead is pleased to host this popular event again this year on Sunday, Aug. 12. The Farmstead’s historic grounds and gardens will be in full bloom and decorated for the garden party. Guests and their dolls can enjoy a fairy scavenger hunt and party favors, purchase doll clothing, have their photos taken with their favorite doll(s) and much more. There will also be an American Girl doll basket raffle. The luncheon, consisting of tea sandwiches, Caprese salad, fruit, cookies and cakes will be held in the Victorian House on the site, which houses the Hull House Foundation headquarters. There will be two luncheon sittings, at 11 a.m. and 2 p.m. The Hull Family Home & Farmstead is located at 5976 Genesee St. in Lancaster. The cost to attend the Girls & Their Dolls Garden Party is $30 for adults and $20 for children ages 3 to 12. Seating is limited; reservations are kindly requested. For more information or to make reservations, call Teri Strait at (716) 683-0855. All proceeds benefit the Hull House. 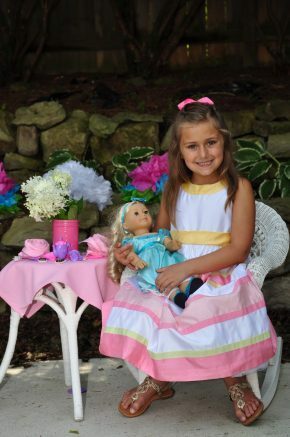 Be the first to comment on "Hull Family Home & Farmstead to host Girls & Their Dolls Garden Party"